When the going gets tough, it’s a natural instinct to turtle. Pull in your flippers, tuck in your tail and head, and curl up until the badness is past. It’s the same instinct that made you hide under the covers when you were a kid and you heard a noise in the night (everyone knows blankets are impervious to monsters). It’s the one that has us reaching for our fluffiest bathrobe and the remote when we’ve been pummeled by the daily shitstorm of life. When the world is full of sharp edges and pointy things, I retreat to a place that feels soft and safe. I dive under the covers the way my anxious cat does when she hears a stranger at the door. But that’s only half the purpose of my mental cocoon. My comfort zone is a clear space in the thicket of chaos. And that clear space is where we do the work. We catch our breath. We take inventory. And yes, we might also catch up on our reading and catch a few episodes of our favorite show. Mainly, though, it’s our chance to be still, to let the swirling confusion settle so that we can see through the murk. We rest and hydrate, because the path ahead is long and there are sure to be hills to climb. We make sure that our provisions are stocked so that we will be able to nurture ourselves and others. We make plans. We get out our crumpled paper and our Sharpies and we draw a map, knowing that we’ll likely end up taking detours. Still, we have to start somewhere, right? Most of all, we remember that we can always return to this space. 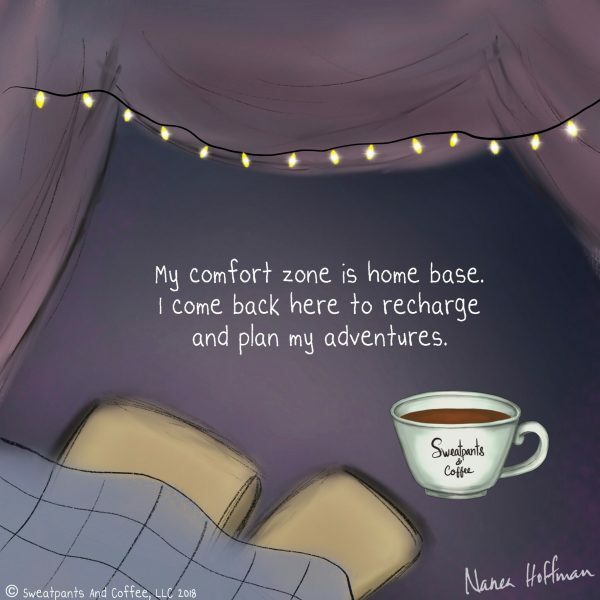 It’s true, you’re not meant to take up permanent residence in a cozy nest of solitude. You’re meant to carry it with you. Mine is full of cookie crumbs and fuzzy pajamas and notebooks and purple gel pens. And of course, huge mugs of coffee with lots of cream. You’re allowed to cry as loud as you want or get irrationally angry or laugh at totally inappropriate jokes. You can make no sense whatsoever, and you can have ice cream for dinner. It’s a known fact that ice cream can be medicinal. But the best thing about my comfort zone is that it’s portable. It’s my mobile charging station. It’s not a place to run away from the world. It’s where you go to find your balance.